September 26 1909 -- Herriman contributes another cartoon in the Examiner's crusade to get LA residents to buy school bonds. This Dwig card is a high-class embossed Tuck production, from the "Cheer Up" series, #176. There is no copyright year, and the postmark is faded, but I'm guessing around 1909-1910. 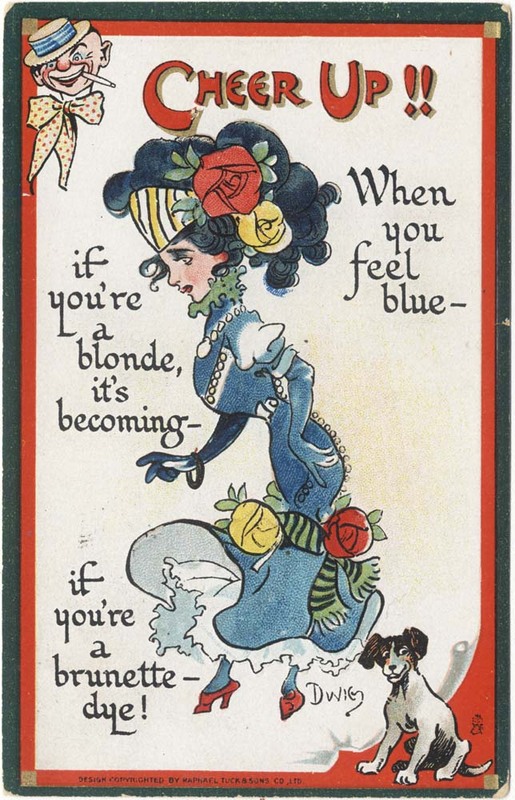 Dwig shows a surprisingly good understanding of color in lady's fashion for a fellow of the age. Frank Mellors Borth was born in Cleveland, Ohio, on April 1, 1918. His birth date is from the Social Security Death Index. Borth identified his birthplace in interviews at the sites American Dream Show and The Catholic University of America (2006). Borth’s middle name, Mellors, was his mother’s maiden name which was recorded on his marriage certificate. In the 1920 U.S. Federal Census, Borth was the only child of Frank and Mabel. His father was a automobile machinist. The family resided in Cleveland at 7018 Clark Avenue, the same address was in the 1930 census. According to the 1940 census, the Borth family address was 3126 West 73 Street in Cleveland. I attended Cleveland high schools and graduated, then attended the Cleveland School of Art. That’s where I learned to be an artist. It’s a four year term same as college. After the four years was up, I wanted to get into some employment for all of this artwork that I knew that I could do. You see, cause I had paid my way through art school by being a sign painter…. One of his classmates was Reed Crandall. Borth graduated in 1940 and moved to New York City in 1941 at the urging of Crandall. They shared an apartment on 37th Street near the Empire State Building. In the early 1940s, Borth’s comic book pages were published by Marvel, Harvey, Lev Gleason, Quality and others. After World War II, Borth drew numerous stories for Treasure Chest comic books from the 1950s through the 1960s. During World War II, Borth enlisted in the army on March 1, 1943. Borth married Barbara Ann Stroh on July 1, 1944 in Dauphin, Pennsylvania, according to the Pennsylvania marriage record at Ancestry.com. Their marriage was noted in the Cleveland Plain Dealer, July 2. A longer article about Borth’s marriage appeared July 16. Home from their son's wedding in Harrisburg, Pa., are Mr. and Mrs. Frank G. Borth, 3126 W. 73d Street. The wedding took place July 1 in Messiah Lutheran Church. The bride is the former Miss Barbara Ann Stroh, daughter of Mr. and Mrs. Charles H. Stroh. The bridegroom is Tech. Sergt. Frank Mellors Borth who is stationed at Indiantown Gap Military Reservation. His grandmother, Mrs. Katerine Borth, was among the Clevelanders at the wedding along with Mrs. Frank W. Flurry and Mrs. C.H. Keller. Miss Priscilla Stroh was maid of honor for her sister, and the bridesmaid was Miss Janet Carpenter. Corp. Nicolai Shutorev was best man, and the ushers were Sergt. Constantine Callenicos, Segt. John Grietzer, Sergt. Edward Robbins and Sergt. Hyman Wasserman. A reception followed at the bride's home. Miss Stroh received her bachelor's degree from Wilson College, Chambersburg, Pa., where she majored in biology. She is now assistant seed analyst in the Pennsylvania Department of Agriculture. Mr. Borth was graduated from the Cleveland School of Art and was an illustrator in New York before entering the army. He has recently completed a mural for the post service club. Borth was discharged February 15, 1946. 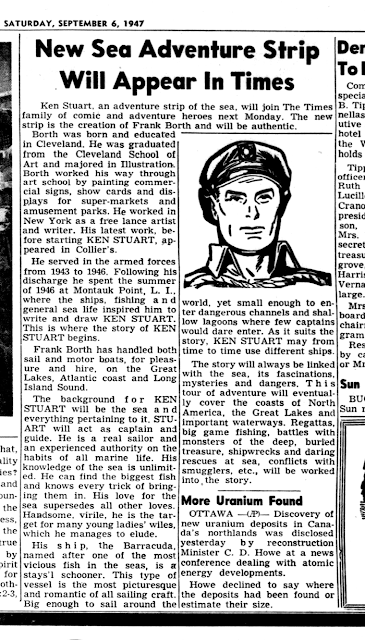 American Newspaper Comics (2012) said Borth created the strip Ken Stuart which ran from September 8, 1947 to 1949. It was distributed by the Frank Jay Markey Syndicate. Later, Borth worked on There Oughta Be a Law which began with art by Al Fagaly who was followed by Warren Whipple. The strip was initially written by Harry Shorten. Borth did the scripting from 1971 to 1983. In the 1980s and 1990s Borth’s illustrations appeared in publications including Isaac Asimov’s Science Fiction Magazine, Amazing Stories, Cracked and Monsters Attack. Borth passed away August 9, 2009, in Newville, Pennsylvania according to a September 2, 2009 obituary at Hamptons.com. The Social Security Death Index said Borth’s last residence was Dedham, Massachusetts, which was his son’s home town. The Frank Jay Markey syndicate was basically a one-man operation (that would be Frank himself, natch). As far as I know, the only real success for the firm was Mr. Markey's own column, which was not even by any means a blockbuster. Still, the syndicate operated for many years in the 1930s and 40s, so the cash flow must have been at least modestly positive. Markey liked comic strips and dabbled in a few releases. Their biggest mark in that realm was talking Rube Goldberg into syndicating Lala Palooza through them in 1936, but the strip was another commercial failure for Rube, who by then seemed to chafe at being the wild and wacky funny cartoonist. Markey's only foray into serious strips was in 1947 with Ken Stuart, written and drawn by Frank Borth. The daily-only strip debuted on Spetember 8 1947*. Borth was primarily a comic book cartoonist at this time and it shows in this strip, which is very much like the lower-end comic books of the day. When I say that, I mean that the art looks rushed and the stories tend to be action-packed but rather dopey. Why did Borth squander this chance at the big time, the dream of most comic book cartoonists? Probably it is because Borth was making so little money off it that he was trying to juggle it along with a heavy schedule of comic book work to pay the bills. 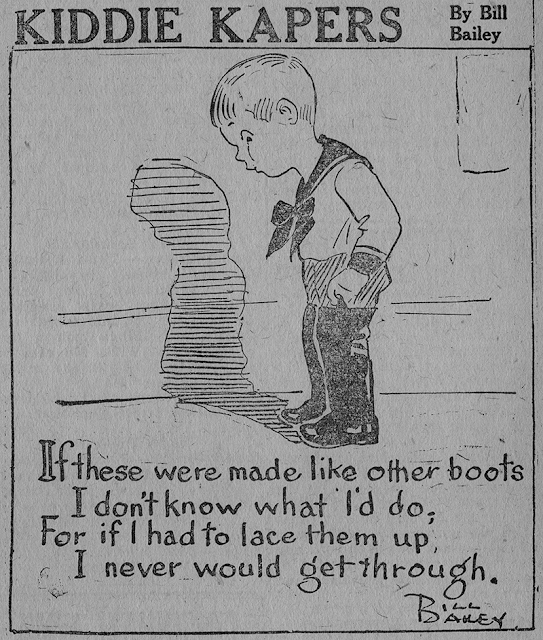 The strip is about a sailor, Ken Stuart, who owns and operates a sailboat for hire. The adventures come with his clientele, who get him into all sorts of jams. Military maritime strip Don Winslow of the Navy was a success, but civilian boating adventures were tried several times in comics, never leaving much of a wake. The earliest I can think of is Coulton Waugh's Dickie Dare, which took to sea under Coulton Waugh's watch and pretty much never looked back. In the 1950s there was Marlin Keel, and in the late 1960s, Kevin the Bold changed focus to become Up Anchor. While some of these strips ran for a long time, none were exactly syndication powerhouses. Markey and Borth gave Ken Stuart plenty of time to catch a strong wind in its sails, but the strip remained stubbornly becalmed. After a year and a half, they reluctantly pulled the plug and let the ship go down. The final strip was April 30 1949**. William Owen “Bill” Bailey Jr. was born on December 9, 1887, in Woods Hole (village), Falmouth (town), Massachusetts. The birth date is from two Massachusetts birth records at Ancestry.com, The American Descendants of Chrétien Du Bois of Wicres, France, Parts 13–16 (1977) and his gravesite. However, Bailey’s World War I and II draft cards have the year 1888. The birth records said Bailey’s father was a signal observer. In the 1900 U.S. Federal Census, Bailey, age 12, was the oldest of three sons born to William, a lieutenant in the Signal Corps, and Mary. Bailey’s brothers were Eugene, 10, and Henry, 8. The family lived in St. Paul, Minnesota at 694 Edmund Street. According to the 1910 census, Bailey, Eugene and their retired father were Brooklyn, New York residents at 12 Lafayette Avenue. Bailey was an engraver in the jewelry trade. The 1915 New York state census said Bailey, his parents and siblings, Henry and Dorothy were living in Mount Vernon, New York at 315 North 7th Avenue. Bailey and his brother were artists. On June 5, 1917, Bailey and Henry signed their World War I draft cards. Bailey resided in Mount Vernon at 317 North 7th Avenue and was an artist in New York City at 20 East 42nd Street; his employer was not named. Henry was married and made his home in Mount Vernon at 406 Union Avenue. Henry aka Harry was employed as an artist at the animation shop, Bray Studio. He passed away in 1958. Bailey’s service record, at the New York State Archives’ World War I Veterans' Service Data and Photographs, had his birth information (birth year 1889), parents names and home address. The artist was inducted at Governor’s Island in New York City on June 16, 1917. Bailey was a private in Army Ambulance Corps, Company 567 which was attached to the 40th Division of the French Army. He was stationed at Camp Crane in Allentown, Pennsylvania. On January 8, 1918 Bailey was sent overseas. He was in the battles at Champagne, Marne (July 1918) and Meuse, Argonne (November 1918). Bailey was wounded July 15, 1918 at Champagne Epreuay. He received the Croix de Guerre twice: first at Champagne, Marne, July 15, 1918, and second at Meuse, Argonne, November 11, 918. Bailey was discharged April 23, 1919 at Fort Dix, New Jersey. The Daily Argus, November 23, 1918, explained how Bailey was wounded. ...From a hospital on July 19, young Bailey wrote home that he was stasioned [sic] just back of the front lines when a terrific fight was commenced. He did not specify the exact sector, but from information subsequently obtained his parents are of the impression that it was at Chateau Thierry, or somewhere between the Marne and the Aisne rivers. It was July 15 and word came for the corps to go forward and get the wounded. For six hours they had been under a terrific gas attack from the Germans, but unmindful of that the ambulance drivers, doctors and stretcher bearers went on. Back and forth went the ambulances, one of which, it is reported, was driven by the Mount Vernon man. While these ambulances proceeded in their humane duty, German aircraft followed them, dropping bombs here and there. 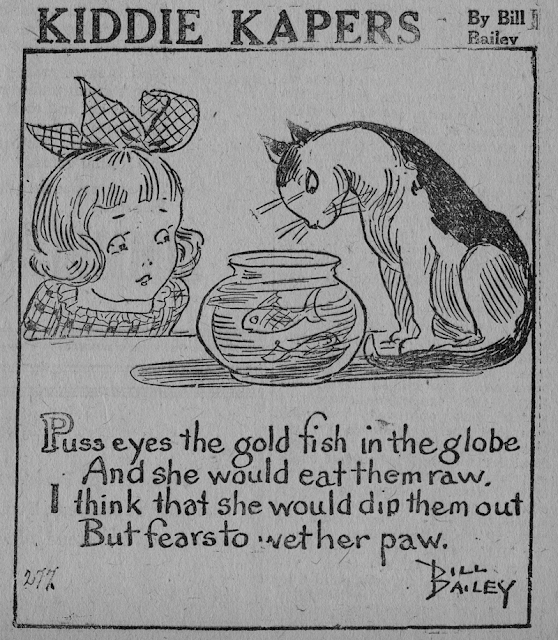 American Newspaper Comics (2012) said Bailey produced the Kiddie Kapers panel in 1918 for the National Cartoon Service. It ran into the 1920s through two other syndicates, U.S. Feature Service, and Columbia Newspaper Service. The 1920 census recorded Bailey, his parents and sister at 317 North 7th Avenue in Mount Vernon. Bailey was a motion pictures artist. Bailey’s marriage was reported in the Daily Argus, October 4, 1922. The Bronx, New York City was Bailey’s home in the 1925 New York state census. His address was 3279 Hull Avenue. Bailey and his wife had a one-year-old daughter, Ruth. With this first magazine in our third volume, we use for the first time the cover selected in the cover contest held last fall. The artist is William O. Bailey, Jr., of New York. Mr. Bailey’s entry in the competition was chosen by the cover contest committee, first for its suitability—the main essential; second, for its ecclesiastical conception and dignity, and third, for excellence of workmanship and flexibility of use. It is not our plan to use this cover regularly—we shall continue our picture covers, which have proved so popular the past two years. There are times, however, when suitable pictures are not readily available and it is well to have a “permanent” cover to fall back upon. Also, some of our readers have had a bit of regretful fondness for the uniform covers of the “old” magazines, Woman’s Work and Home Mission Monthly, and they have written us of their desire to “see the same cover” occasionally. Again, this new cover will allow us a little more opportunity in the use of color, for not all colors are satisfactory on our paper in connection with all-over pictures. The space occupied on this cover by the picture of the Mount of Olives—a truly Easter view—will occasionally be taken by announcements of articles or verse. A brief account of Mr. Bailey is printed elsewhere in this magazine. In the same issue was a profile of Bailey. He was horn in Woods Hole, Mass., in 1889 [sic], and at the early age of thirteen set out to earn his living. His desire for art led him to become apprentice to an engraver but while learning and working here, he went at night to study art in the Art Students’ League of New York. There he won a scholarship, and soon began to “get experience” in the art department of an advertising agency During the World War. Mr. Bailey served overseas, being wounded at the Battle of the Marne. He later returned to the front, and finally went with the Army of Occupation into Germany. He was decorated with two citations for the Croix-de-Guerre. The 1930 census said advertising artist Bailey, his artist wife and two daughters, were in the household of Walter A. Miles, his father-in-law. Also in the household were Miles’ wife, daughter and two sons. They lived in Mount Vernon at 37 South Eleventh Avenue. The Bailey family of four made their home in Eastchester, New York at 67 Archer Drive, as recorded in the 1940 census. In 1939 Bailey worked 52 weeks and earned $2,600 as an artist in the theater industry. Bailey signed his World War II draft card on April 25, 1942. His home address was 305 Sixth Avenue in Pelham, New York. His employer was Paul Terry, located at 271 North Avenue, in New Rochelle, New York. Bailey’s description was five feet ten inches, 145 pounds with blue eyes and gray hair, and “gun shot wound right lower jaw”. A photograph of Bailey, from a Christmas card, is here. One is almost immediately in a world of fantasy when viewing a watercolor done by William O. Bailey, showing a steep bluff reaching into the sky with a narrow peak. Overhanging this peak on both sides is a crumbling frame house. Grotesque arms of naked trees are thrust out from either side of the bluff. An unusual sensation of “waiting” for a catastrophe is created by the painting. The Daily Argus, March 14, 1951, said Bailey won a blue ribbon, first prize for his watercolor, “Light Snow”, at the annual Westchester Woman’s Club exhibition. Bailey passed away May 27, 1964. He was laid to rest at the National Cemetery in Beverly, New Jersey. Kiddie Kapers may not offer a lot of obvious interest, sporting as it does rather weak cartooning and lackluster poetry, but there is an interesting aspect to this feature. If you're not a real newspaper comics geek, you can go ahead and stop reading now, because I'm not going to be telling you that creator Bill Bailey was the actual guy the famous song was written about or anything exciting like that. 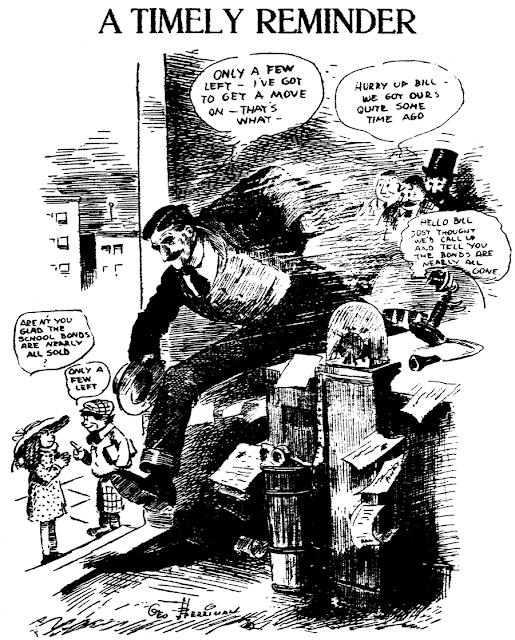 No, what I find interesting is that Kiddie Kapers helps to shed some interesting light on a few hole-in-the-wall syndicates.Those not already nodding off, please continue reading. The feature was originally syndicated by National Cartoon Service, which only had a handful of known offerings. They seemed to have come onto the scene in early 1915 with a short list of three features, and added a few more features later that year and in subsequent years. Their schtick was to number each episode, and sell the material in batches -- this was seen as a useful thing by some small papers that were more interested in filling holes than in running an every day regular comic strip. It also allowed NCS to resell their few offering year after year. Ken Kling's Hank And Pete, debuting in 1916, was the closest thing the syndicate ever had to a success. Kiddie Kapers appears to have been the final new feature offered by NCS, first appearing as best I can tell in February 1918*. Kiddie Kapers may have been a Johnny-come-lately at the faltering syndicate, but in comparison to their other features creator Bill Bailey cranked out material at a much faster clip if the numbering of the panels is any guide. 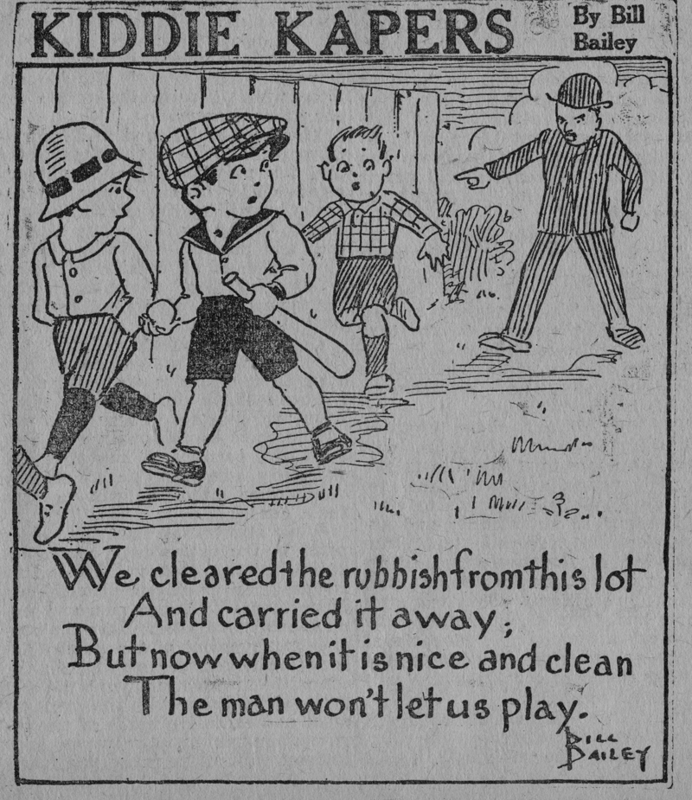 By the time NCS seems to have called it quits in mid-1919, the numbering of Kiddie Kapers was already up into the 100s. When NCS was shuttered, much of their material was sold to another hole-in-the-wall syndicate, called the US Feature Service. That is my presumption, but maybe US Feature Service was actually a more generally named continuation of National Cartoon Service -- I can find no evidence one way or the other. In any case, US Feature Service used the same business model as NCS, numbering their strips and reselling them for years. I used to presume that the NCS material they inherited was sold only in reprints, but further research shows that Kiddie Kapers, at least, was still being cranked out by Bill Bailey for the new company. The numbering on his panels grows to at least the 300s in the newly-categorized "A" series, and at least into the 200s for a B series. At some point most of US Feature Service's material migrated over to yet another hole-in-the-wall outfit, this one called the Columbia Newspaper Service. Unlike the others, Columbia seems to have never produced any new material -- they merely resold old stock. The date on this changeover is much harder to pin down. 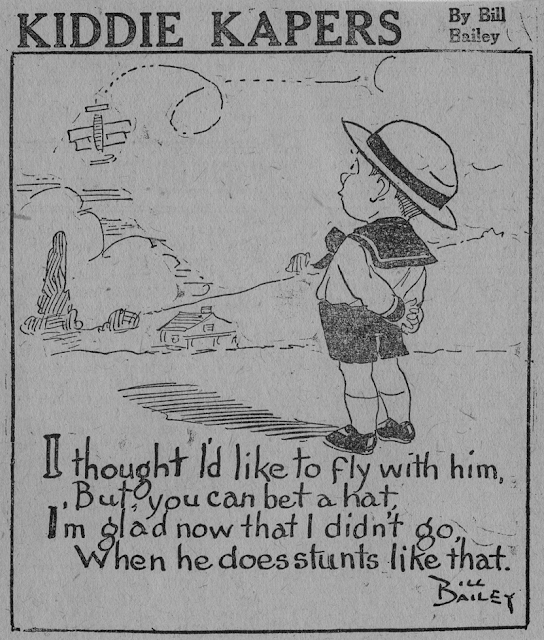 Kiddie Kapers seems to have made the transition in 1922, at least that's when it starts appearing with the panel numbers and US Feature syndicate stamps removed, but other features didn't seem to make the transition until later. Either that or Columbia didn't even bother to take the old syndicate stamps off some material. It is hard to tell just how long Columbia continued reselling their material, because papers that bought these big batches could run them literally years after making the purchase. However, the last year that Columbia advertised their moldy old wares was in the 1930 edition of the Editor & Publisher Syndicate Directory. * Source: Salisbury Evening Post.